After the guests had all assembled in the huge hangar following embarkation between 7:00 and 8:00 a.m., they had light breakfast service and safety briefings, then the ship got underway at 9:00 o’clock. Guests onboard were treated to a whole lot of military entertainment, including static displays of Marine Ground Combat Equipment and Navy Damage Control Gear. Guests also watched with amazement as a Landing Craft Utility (LCU) was recovered into the “belly” of the ship. 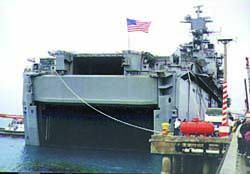 AD3 Russell Lloyd, an aviation machinist on board for over a year, told Japan Update that the LCU could carry 300 people in an amphibious assault and for medical landings. It also had a birthing place for 12. 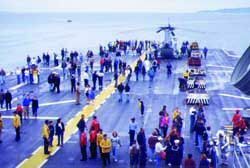 Meanwhile, most of the entertainment was on the Flight Deck, where helicopters flew from the ship, over and around the ship several times, finally offering perfect demonstrations of Helo Fast Rope landings. All through the day, the cruise that took guests far off the coast of Okinawa allowed them to discover what it is like to live on a huge battle ship. Men, women and children alike were subject to special treatment by the Belleau Wood crew wherever they went in the huge carrier that someone described as “a city moving on water.” The best part of the outing, for most, may have been the sumptuous and delicious food that was served for lunch. One Japanese commented that it was the best food he had ever had on any American facility. Speaking to reporters just before the cruise got underway, Cap. Tom Parker (Belleau Wood Commanding Officer), Col. Fulton (31st Marine Expeditionary Unit) and Cap. Lee Toucheberry (Amphibious Squadron Commander), said the cruise was designed “to give a little something back to the Okinawa community, our second home.” It was a day for the local businessmen and Okinawa government authorities to join their American friends in relaxation, while military families got a first hand view of their spouses’ lives on a battle ship. Many of the people on board expressed satisfaction all day long with the services and entertainment onboard. Leon Hill, Battalion Commander of the Okinawa Young Marines, who had taken Young Marines onboard, said the cruise had given them an opportunity to come face to face with the daily experience of parents in the military, especially when they are out on a crucial mission. Chris Abraham, a Marine pilot, said he even had the chance of meeting people working on the ship that he had known before stateside. “I met Lt. Glenn, my former flight instructor, working on this ship. What a great surprise!” he exclaimed. For his wife, Carry Abraham, it was the first experience on a Navy ship. “Now I know what my husband does every time he goes away. I have seen their way of life on this ship and - big news - I didn’t get seasick...” she reported. In raw material alone, the Belleau Wood required enough steel to manufacture over 20,000 cars, aluminum sufficient to produce 130 million soft drink cans, over 1,000 miles of electric cable, and enough fuel onboard to operate a family car for some 125 million miles. The ship has the capability of creating enough fresh water each day to supply the needs of 6,000 people. It also has one of the largest hospitals afloat with 300 beds, 4 operating rooms and 3 dental facilities. 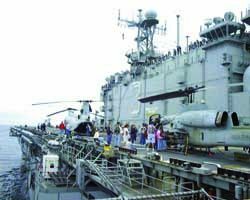 Its Flight Deck can handle 10 helicopters simultaneously, as well as AV-8 Harrier jump-jet aircraft and OV-10 Bronco fixed-wing turboprop reconnaissance aircraft. The ship can carry several war vehicles, jeeps, trucks and tanks in its hangar.